BETTER PRODUCTION MMS JULY 2018 110 mmsonline.com GE AR PRODUCTION Collet Chucks Overcome Distortion for Automated Gear Machining The production of gears has changed dramatically over the past 25 years for Global Gear & Machining of Downers Grove, Illinois. While the shop once focused on dedicated pieces of standalone equipment, each pumping out one type of gear in batches of hundreds of thou- sands, this production method is no longer viable. 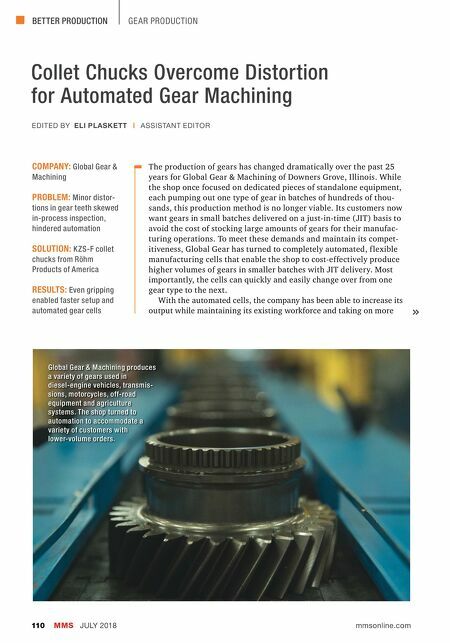 Its customers now want gears in small batches delivered on a just-in-time (JIT) basis to avoid the cost of stocking large amounts of gears for their manufac- turing operations. To meet these demands and maintain its compet- itiveness, Global Gear has turned to completely automated, f lexible manufacturing cells that enable the shop to cost-effectively produce higher volumes of gears in smaller batches with JIT delivery. Most importantly, the cells can quickly and easily change over from one gear type to the next. With the automated cells, the company has been able to increase its output while maintaining its existing workforce and taking on more COMPANY: Global Gear & Machining PROBLEM: Minor distor- tions in gear teeth skewed in-process inspection, hindered automation SOLUTION: K ZS-F collet chucks from Röhm Products of America RESULTS: Even gripping enabled faster setup and automated gear cells EDITED BY ELI PLASKETT | ASSISTANT EDITOR Global Gear & Machining produces a variety of gears used in diesel-engine vehicles, transmis- sions, motorcycles, off-road equipment and agriculture systems. 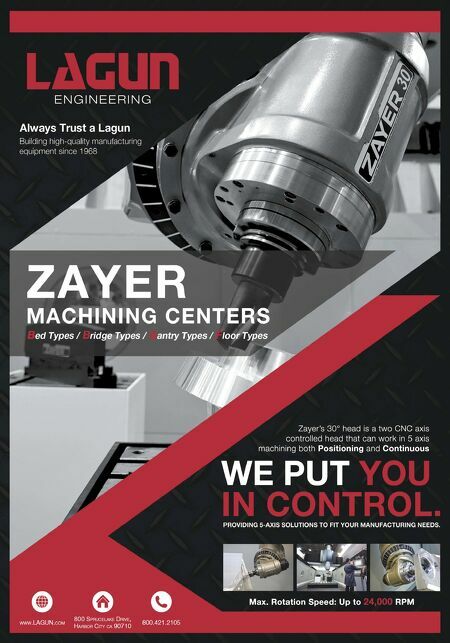 The shop turned to automation to accommodate a variety of customers with lower-volume orders.